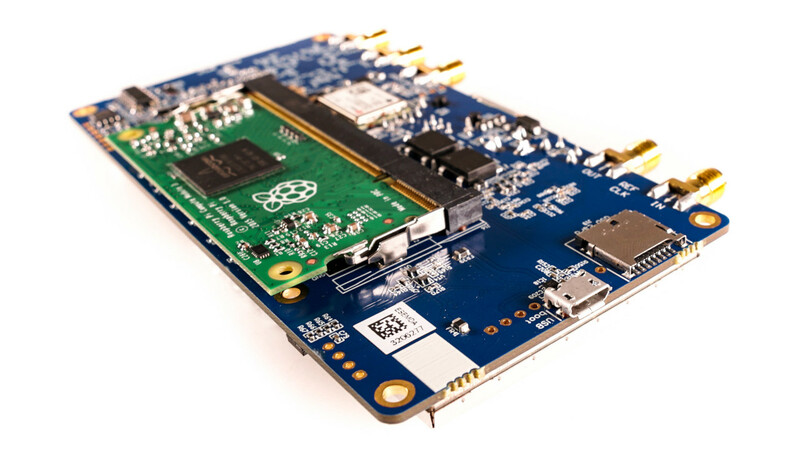 October 17, 2018 – Lime Microsystems is proud to announce the launch of a crowdfunding campaign, in partnership with Crowd Supply, for the LimeNET Micro software-defined radio (SDR) platform with integrated general purpose processor (GPP) based on the Raspberry Pi platform. Building on the company’s previous LimeNET designs, crowdfunding for which closed at more than three times the target goal, the LimeNET Micro is designed to be a more affordable, low-power alternative suited to both commercial deployments and use in education and hobbyist sectors. The compact device’s radio capabilities, based on Lime Microsystems’ popular LMS7002M field-programmable radio-frequency (FPRF) integrated circuit, are combined with the flexible yet powerful Raspberry Pi Compute Module 3 – or, using an optional adapter cable, a mainstream Raspberry Pi board – to provide an all-in-one and entirely standalone system at an extremely low cost. With its small size, low power requirements, and affordability, the LimeNET Micro is well suited to a range of potential use cases: enterprise and personal networks, rural deployment for autonomous and resilient networks, as a universal Internet of Things (IoT) communications hub, radio astronomy and amateur radio projects, radio spectrum survey, passive wireless geolocation, and research into everything from security to radio-frequency aware robotics. Its programmability also allows it to be quickly and easily integrated into application-specific radio-frequency appliances ready for rapid deployment. In addition to its core LMS7002M and Raspberry Pi Compute Module 3 components, the LimeNET Micro includes an Altera MAX 10 field-programmable gate array (FPGA), a u-blox Neo Global Navigation Satellite System (GNSS) receiver as a high-accuracy timing source, and 4MB of flash memory for user data, in addition to the storage available via the Raspberry Pi Compute Module 3. Measuring just 125mm x 65mm, the board is extremely compact and can be powered via a DC power supply or Power Over Ethernet (POE) to simplify its deployment. As with Lime Microsystems’ LimeSDR product family, the LimeNET Micro is free and open source: all code, firmware, schematics, printed circuit layout, and associated projects files will be made available to all. The LimeNET Micro also ties in to Lime Microsystems’ Lime Suite software bundle, providing a familiar environment for anyone using or developing on the LimeSDR family at present. Selected pledge levels also include PantaHub pre-loaded, providing an powerful platform for the development, deployment, and management of interconnected bare-metal infrastructure. Pledges for the LimeNET Micro begin at $175 for the Early Bird version, rising to $269 once the initial batch is exhausted. Higher pledge levels include a version housed in an acrylic case with fan and heatsink system for $399 and a version housed in an aluminium case for $459. Additional components can be ordered at the same time, including SMA radio antennas, a GPS antenna, and an adapter cable which allows the Raspberry Pi Compute Module 3 to be replaced with a mainstream Raspberry Pi single-board computer. More information is available on the LimeNET Micro campaign page, while full specifications are available below.